I am become Death, destroyer of crates. Also vases. And skeletons. And bees. And, oh yes, enormous slavering eldritch horrors from Hell. I destroyed a bunch of those, too. Darksiders II begins more or less where the first Darksiders left off. In that game, War—as in, the apocalyptic horseman—accidentally triggers the Armageddon before the correct moment and everything, more or less literally, goes to hell. But it was a set-up; other powers used War for their own ends and he is, if not blameless, at least not as guilty as other parties think. Darksiders II stars War's brother and fellow horseman, Death, as he attempts to set the record straight and redeem War's good name. Doing so mainly involves going places and killing everything that lives there. Plot-wise, the game never does make any more sense than that. But that's okay. It's the video game version of the summer popcorn flick, and that's not a bad thing. WHY: Because although the game is entertaining and fun to play, the sheer number of bugs encountered in the PS3 edition really need a patch. We're waiting for confirmation on if the Xbox 360 and PC versions are plagued with the same issues or not. What I played: The entire story arc (without any side quests), in < 25 hours, on PS3. Mid-and late-game combat is extraordinarily satisfying if you happen to enjoy being a madly cackling whirlwind of death. The scope and scale of both dungeons and overland realms. Death is a big guy, and the Forge Lands make him look tiny. The mad proliferation of occasionally game-stopping bugs. The rule of threes gone amok. Recruit three lords, but to get one to come with you you'll need to perform three tasks inside his dungeon... at a certain point it becomes Threeception. "I have to go to the land of the dead." "This is one of those questions you shouldn't ask." "So you're invincible in this game, right?" "Nope. That's my health meter, and I have potions." "But if you die, who kills you? And when you do, does everyone else become immortal?" "Remember what I said about questions?" Much in common with certain blockbuster films, it can be a delight to watch as long as you don't look through the logic holes. The game makes a covenant with you: if you promise not to think about any of it, it will provide you with the tools you need to travel, and the reasons to keep pressing onward. Like the double-bladed combat and inventory full of magical garb, that need not to think too hard about the construction and purpose of the world is something Darksiders II borrows handily from games that came before it. 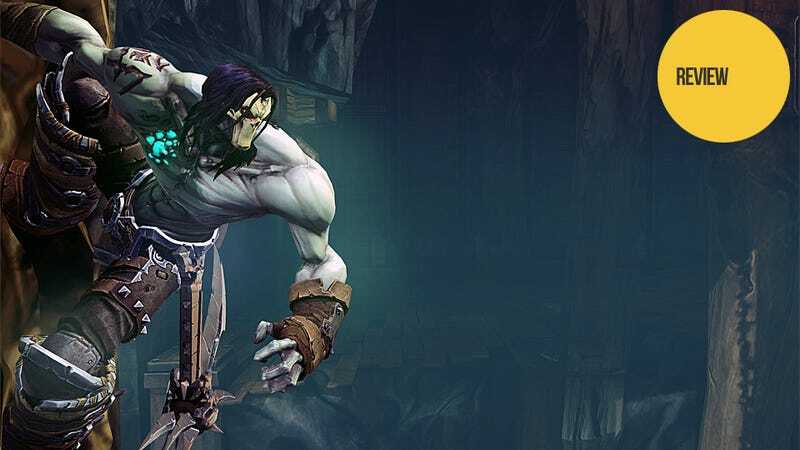 Darksiders was a pastiche of other games, brought together into a new package. Darksiders II is, in many ways, more of the same. Death's default weapon, the double scythes, feel so much like Kratos's arm-blades that it took me several hours to stop trying to use combos and motions still stored in my muscle memory from the God of War games. So. For players who were wondering what would happen if God of War cross-bred with Zelda, then added a touch of the Kingdoms of Amalur aesthetic, and added dungeons that were essentially Fallout 3 and Portal, the answer is: you get Darksiders II. The amazing part is, after a sort of rough beginning, the odd medley actually works. It does take three or four hours for all the disparate pieces to feel smoothly integrated. Like cooking or—better yet—like baking. When baking, it takes time and patience to get all of the ingredients in the bowl to stop being just ingredients, and to start being a cohesive dough. So, too, with Darksiders II. Certain elements never do quite work. One late-game dungeon, set on a post-apocalyptic Earth, very suddenly invalidates everything Darksiders II has taught the player over 16+ previous hours of play. The modern, real-world setting, full of destructible cars, isn't actually the problem. (In fact, it's a pretty great change of pace.) The mechanics, on the other hand, are completely upended. It's a large area with no climbing, and rather than being able to use the abilities and weapons he has leveled up over two previous large acts, Death is more or less constrained to an awkward, two-handed angelic machine gun that makes taking any other action more difficult than it has to be. Put down the gun, open the chest, pick up the items, pick up the gun, move to the left, kill two things, put down the gun, melee kill the other twenty things, pick up the gun... The weapon was a frustrating exercise in "ideas that looked better on paper than in practice." Still, the game did try to provide new guns frequently, as if it knew that, at some point, I would have given up and left mine lying behind me in the dust. Aside from some exceptions like Salvation (the machine gun), the tools that Darksiders II provides with each new area generally work well. And again, aside from the same exceptions, each added mechanic—a grapple, an ability to be in two places at once, and so on—generally carries forward well from dungeon to dungeon and act to act, staying useful as Death continues his journey. A colleague and I discussed Darksiders II while I was playing. I said to him that I had been ready to hate the game, realizing how utterly derivative it is, but that somewhere around the four-hour mark, Death had grown on me. The stolen and borrowed parts, I remarked, had grown into an entertaining whole. He agreed: "You're just like, 'this is just Zelda with a growly grouchy man in bad World of Warcraft armor.' Then four hours in, you're like, 'This is great! It's like Zelda! But with a guy in grouchy WoW armor!" But his final verdict summed up everything I was thinking about Darksiders II: "If you're going to steal, steal well." A collision problem during the fight with the Guardian. The script requires players to grapple onto the boss's shoulder and to strike a gem there. Multiple times, with both shoulders, the grapple would take Death inside the shoulders, gripping an invisible point from which his scythes could not connect with the gem. Eventually he would drop to the ground and I could try again. Even though I knew the script and understood the tactics, I had to repeat each part of the fight 2-3 more times than should have been required. Late in Act II, there is a vertical platforming section requiring Death to scale the inside of a tower while a very lethal floor (on fire, covered in spikes) inexorably rises beneath him. Touch the floor, and it's all over. When I finally succeeded at climbing the tower, I hit X (the jump button) in order to ascend from the final landing position to safe ground, and got stuck. Death hovered in mid-air, apparently the victim of invisible geometry. Then an amazing thing happened: the game tried to trigger both the "you have been stabbed by the spiky floor and are dead" animation and also the "you have successfully navigated this obstacle and here is a pan of the room showing your next door" animation. The screen glitched, jittered, and tore for a brief, horrifying "Schrodinger's Death" moment before resolving into a loading screen. The end result? The game had decided that yes, I died, and would need to respawn—but it also had decided that I completed the platforming section, and so I respawned at the top, instead of at the lower checkpoint. The next-to-lass boss is probably the most difficult of the game. I learned his fight and eventually won, but no cut-scene triggered. Instead, he simply vanished. Loot lay where he had stood, and it looked as though I should be able to retrieve it, but I was stuck. Nothing on my controller worked except for Start, which allowed me to pause, change the options, or quit, and the right stick. I could move the camera around to get a good look at how stuck I really was, but that was it. I turned off the controller and swapped it for a freshly charged one, just in case the issue was with the controller, but the end result was the same: no left stick, no d-pad, no control buttons or triggers. I restarted the game and fought the boss again. When asked about a patch, THQ PR responded that Vigil was "looking into the issue as we speak," and added, "The team is currently polishing "Argul's Tomb" [DLC] and prepping bug fixes for an imminent submission to first party." Bugs aside, the game doesn't always work. Some puzzles are more obtuse than they should be, and sometimes, even when they work in theory, something gets stuck in practice. There's a lot of irritating backtracking deliberately built in. Swapping tools and skills can be clumsy, and certain sections near the end overstay their welcome, slow down the action, and are just tedious. There is too much pixel-hunting when it comes to performing any action; finding the exact right spot to stand in order to have the option to act can be a pain. But when it does work, it's a gloriously stupid romp that's far more entertaining than it has any business being. By the time the player has trained a few scythe combos and special skills, combat is satisfyingly solid, and the ability to customize weapons, gear, and skill choices lets the player craft a combat experience well-suited to his or her own preferred play style. I grew to find myself actually liking Death, by the time the heavily-foreshadowed end finally came. Ultimately, the bugs in the PS3 edition of Darksiders II are a disappointing stain on an otherwise entertaining game. It would be nice to give the game a YES, but we don't yet know if the Xbox 360 and PC versions are clear of the bugs I encountered on the PS3. Hopefully, the game will see a patch sooner rather than later.